Bio-Linked is an electronic roster of people willing to help researchers find cures and treatments. You submit a confidential, self-managed profile of only the medical and social information you are willing to offer. This allows your participating blood center to then anonymously search to find people who meet research needs. Our updated website, bio-linked.org, has a detailed series of profile questions for registrants to answer. Our registrants are interested in research for cancer, diabetes, infectious disease, auto-immune disorders and more. In Oklahoma, diabetes and Alzheimer's research is being conducted right now utilizing participants from Bio-Linked, and more study participants are being sought. For potential participants, filling out the new BIOPROFILE is key, so that scientists can narrow or widen their search for study participants as necessary to conduct their clinical research. The questions within the bioprofile may change, so returning to update the bioprofile occasionally is recommended. Your information is stored in a private, secure database used to locate people with specific medical, family and social backgrounds that match-up with research opportunities. Only you and a few restricted staff at our blood centers can see your answers. Your information will never, be shared with anyone else, unless you give written consent. You have trusted us as a blood donor, and we will never break that trust. Scientists contact our blood center for help with clinical trials and basic research. The researchers are often looking for people with very specific conditions or symptoms. When a researcher contacts the blood center, we will search the Bio-Linked database to see if anyone matches the need. If an individual is a fit, we will contact that person and ask if he or she is interested in participating. HOW CAN I OBTAIN MY HLA RESULTS? If you have previously registered, you can request your HLA results by contacting our HLA administrations hlarequest@bio-linked.org. If you have not yet registered, you can become a life-saving participant by visiting Be The Match®. WILL I EVER BE PRESSURED TO PARTICIPATE IN RESEARCH? Absolutely not! If you match a researcher’s need, one of our staff will contact you. If you have any interest in participating, we will explain what is needed, and how that may affect you. The choice to move forward is completely yours. Unless you agree, the researcher will never know your identity. WILL I EVER RECEIVE PAYMENT FOR PARTICIPATING? Possibly, but each research project is different. Some, but not all have budgets for paying participants. WHY IS MY BLOOD CENTER DOING THIS? To expand our life-saving mission! There are more than 16,000 clinical studies occurring at any one time in the United States. These studies could provide cures or treatments for diseases that affect our friends and neighbors. This progress is often delayed many years because scientists cannot locate people to participate in their research. By helping researchers locate willing participants, we are doing our part in bringing new hope to patients as soon as possible. A specialized type of stem cell called a mesenchymal stromal cell (MSC) is primarily found in bone marrow, and to a lesser extent in placenta, fat, teeth, and blood. These cells have the potential to develop into many tissue types throughout the body like bone, cartilage, muscle, and skin. They also control immune responses, promote wound healing, and support tissue regeneration. 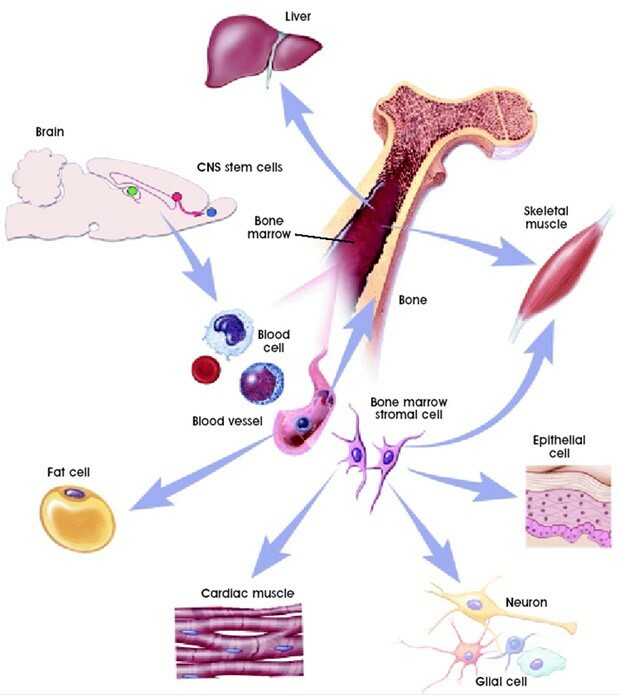 Inside the bone marrow, MSCs provide support for hematopoietic progenitor cell (HPC) development into blood cells. The diverse developmental potential and functions of MSCs make them ideal for a wide variety of therapeutic uses. There are thousands of research and clinical studies underway analyzing the ability of MSCs to prevent transplant graft attack on host tissue, control the development of autoimmune diseases, and promote tissue healing from heart attack, stroke, spinal cord injuries, liver disease, chronic wounds, and many other injuries and disorders. However, it is currently difficult to obtain enough MSCs to meet the growing demand for research and therapy use. To address this problem, the Oklahoma Blood Institute is partnering with LifeShare of Oklahoma to collect bone marrow from deceased tissue donors, grow MSCs from bone marrow in our facilities, and make MSCs available to our community scientists for use in research and therapy development. In Oklahoma Blood Institute's Bio-Development Division, we are conducting several research studies to grow and characterize MSCs from deceased donors and demonstrate their potential for therapy use. This work will increase the supply of MSCs available to clinical scientists to use in therapies focused on wound healing and tissue regeneration, as well as for treatments of autoimmune and inflammatory disorders. The cutting edge of many new medical advances involves using the body's own immune cells in new ways. For these therapies to work, scientists often need to make a "tissue match," also known as an "HLA match" between the treatment cells and a patient. By including your HLA type as part of your Bio-Linked profile, you can put yourself at the front of the line to be part of amazing discoveries and life-changing cures! If you are signed up to be a marrow donor through the Be The Match registry, you have your HLA typing information on file with the National Marrow Donor Program. By simply sending a request to HLARequests@Bio-Linked.org, you can request a copy of your HLA results. Once you receive your report, we now have an area for you to input this important data into your Bio-Linked profile. Please help speed our research efforts by making this critical upgrade to your profile! If you know your HLA type from a lab work done from a source other than Be The Match. that would be equally valuable. For your reference it is usually provided in a format similar to one shown below.